Some 39 members of Los Angeles Children’s Chorus are featured in Los Angeles Opera’s production of Humperdinck’s “Hansel and Gretel” conducted by James Conlon and starring mezzo-soprano Susan Graham as the Witch, mezzo-soprano Sasha Cooke as Hansel and soprano Liv Redpath as Gretel, with six performances from Nov. 17 to Dec. 15 at the Dorothy Chandler Pavilion. LACC’s new Artistic Director Fernando Malvar-Ruiz prepared the young choristers for their roles as the gingerbread children, noted for their intricate four-part harmony. A perennial favorite, “Hansel and Gretel,” based on the Brothers Grimm tale and sung in English, features a magical score and plot and is considered to be the composer’s best-known work. 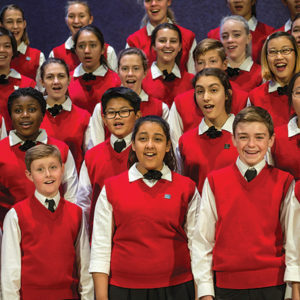 The featured LACC choristers include Christer Avendano, Christof Avendano, Mimi Bernstein, Andrew Bigelow, Quinn Fagan, Tessa Henriod, Karina Ho, Megan Hoffman, Madison Spitzer, Leah Taylor, Reagan Voxman, Oscar Yum and more. LACC serves more than 400 children ages 6 to 18 from 50 communities across Los Angeles. In addition to the LA Opera, the chorus performs with such leading organizations as Los Angeles Philharmonic, Hollywood Bowl Orchestra, Los Angeles Master Chorale, Los Angeles Chamber Orchestra, Pasadena Symphony and POPS, and Calder Quartet and Jacaranda. Tickets for “Hansel and Gretel” begin at $16. The Dorothy Chandler Pavilion is located at 135 N. Grand Ave. For information and tickets, visit laopera.org, or call (213)972-8001.